A long-running partnership between Teesside University and Darlington-based engineering firm Cummins is now helping a recent graduate to make his mark - both professionally and academically. 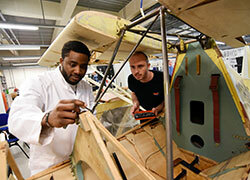 Manufacturing Engineering Manager Steve Morley and Teesside University graduate Barry Moore. Barry Moore, who graduated with a BEng (Hons) Mechanical Engineering, is now working at Cummins as part of a short Knowledge Transfer Partnership (sKTP). 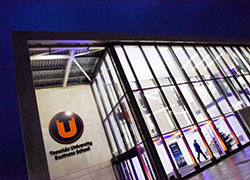 He is also completing his PhD at Teesside University, with on-going support from Cummins. Cummins, who manufacture, supply and service engines and related technologies, has previously collaborated with the University on student and graduate placement projects and there are plans to continue working together on future projects. 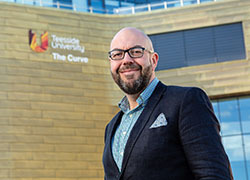 Barry, who lives in Marske-by-the-Sea, is relishing the opportunity he has been given to put his knowledge into practice at Cummins, while also studying towards his PhD part time. He said: 'It is demanding, but it is thanks to the links between the University and the company that people like me are able to develop. KTP and sKTP schemes are a business-University partnership, aimed at improving productivity and performance through a strategic project. The company gets access to academic skills and expertise, along with a graduate recruited specially to work on the project. 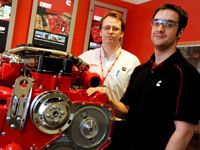 Barry, 32, is working with Cummins to improve its engine painting processes, which is also the core subject of Barry’s PhD. The company expects to benefit in a number of ways from the project, including cost and time savings and improved processes which ultimately will lead to better customer service. Manufacturing Engineering Manager Steve Morley, who is Barry’s sponsor during his time at Cummins, said: 'So far it has been a really successful collaboration. Barry has brought in a new set of skills and ideas which we didn’t have before. Vahid Askari, a Senior Lecturer in Engineering/Automotive Design at Teesside University is the academic supporting Barry’s sKTP at Cummins.